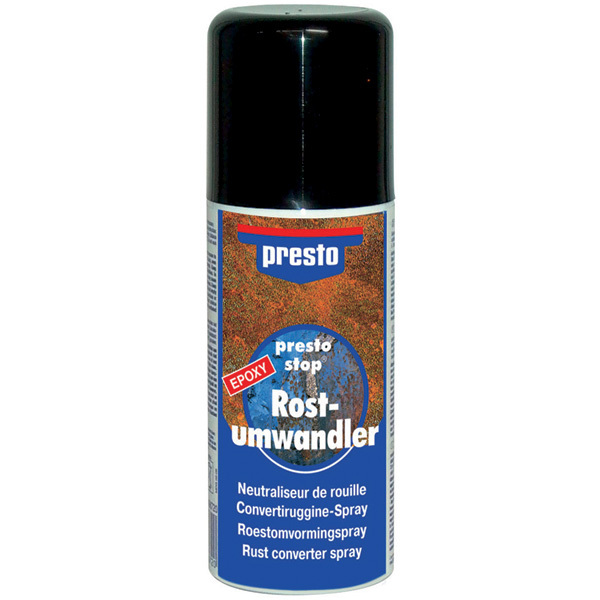 presto stop Rust Converter Spray is a rust converter and primer in one work step. This rust restoration system on epoxy resin basis merges with the neutralized rust layer to a metallic-organic iron complex. This black, very compact protection layer builds the primer and is the basis for the subsequent, durable lacquer finish. 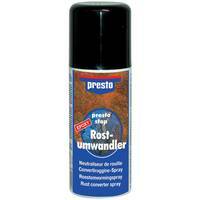 Excellently suitable for the restoration of vehicles, machines and all kinds of facilities. Recommendation: our presto assortment offers the right putty for all purposes, e.g. the presto Body Filler for universal use. Rust emerges into a water-unsoluble, black, organic iron complex. This iron complex compound is stablized by a special epoxy resin, which protects the iron from external influences. The drying time depends on temperature of surrounding area, air humidity and applied quantity. Remove rust, fat, dirt as well as paint flakes which are infiltrated by corrosion; use a brush if necessary. Before use, shake the can for approx. 2 minutes. Apply 3 - 4 layers, depending of degree of corrosion. Coatable after approx. 6 hours, depending on ambient temperature. Additional stoving makes the protective coat especially resistant to water-, saltwater and solvents. Let the sprayed coat dry for 15 minutes, then stove for 15 minutes at 160°C.